Summary: From the New York Times bestselling author of Still Alice Lisa Genova comes a powerful and transcendent new novel about a family struggling with the impact of Huntington’s disease. I'm still trying to catch up on reviews and it doesn't seem like I'm making much headway. 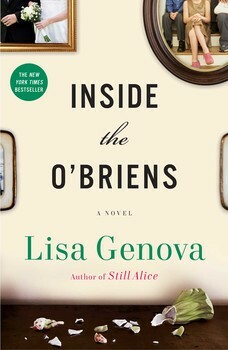 The latest book that has been sitting in my finished pile since late June is INSIDE THE O'BRIENS by Lisa Genova. I read this novel while I was vacationing in the Outer Banks, and it is probably the most memorable book I read during that week. I absolutely loved this novel. INSIDE THE O'BRIENS tells the story of Joe O'Brien, a man who is diagnosed with the neurological disorder called Huntington's disease. It also shows the devastating effects this diagnosis has on his entire family. Joe is a 44 year old cop, husband, and father of four adult children who lives in the Boston suburb and Irish Catholic neighborhood of Charlestown, Massachusetts. Joe is a respected police officer and devoted husband and father who starts showing signs that something isn't quite right. He has outbursts of temper, disorganized thinking and involuntary muscle movements. When he receives the diagnosis of the rare, but fatal, Huntington's disease, the lives of the entire O'Brien family are turned upside down. I thought INSIDE THE O'BRIENS was an excellent novel. I was riveted to the story and became fully entrenched in the lives of the O'Brien family. There were parts of this novel that made me laugh and many more parts that made me cry. Overall, I think this book resonated with me like few books do... which is rather ironic considering that the characters and their experiences are totally foreign to me. I appreciated many things about this novel, but what I think I appreciated the most was how Ms. Genova brought these characters to life and put a name to such a horrible disease. Joe was the patriarch of this big family and he represented strength and stability to this family, so when he was diagnosed with a debilitating disease, it was a major strike to his wife and children. The way the author portrayed Joe and how he handled the decline in his body was well done and so very realistic to me. In addition to dealing with Joe's diagnosis, the odds of carrying on the disease to his children was 50%. The children not only had to face that their father was slowly dying in a horrible way, but that they had to decide if they wanted genetic testing to see if they were carrying the gene. Knowing, or not knowing, whether they were potential victims to Huntington's would affect many of their future decisions. Just imagine how terrifying it would be to first wonder if you had it and then to know that there was a good chance that you were going to die from this disease. I also appreciated how the author brought Joe and his wife and his children to life. I already mentioned how well she portrayed Joe, but I also thought she did a wonderful job with Joe's wife. She was a strong woman but the stress of taking care of Joe and worrying about her children was all consuming. My heart broke for her over and over again in this novel. In addition, I liked how Joe's four adult children all handled things very differently. I think the various ways they dealt with their dad's declining health and their decision to have genetic testing really hit home to me just how much the after shocks of this diagnosis changed everyone's lives. There is no doubt that this book was not an easy read for me. I cried often and had a nervous stomach for so much of the story. What happened to the O'Brien family could happen to any of our families, and in many ways, it was a wake-up call for me. This novel showed how precious life is, but it was also a reminder not to take our health for granted. In addition, I loved how Joe eventually lived with his disease. (Notice I used the word "lived.") He showed his family what it means to live with a fatal disease with dignity, and that was the best gift he could give to his loved ones. I loved INSIDE THE O'BRIENS and highly recommend it to fans of literary fiction! This sounds terrific! I like the way she brings attention to diseases and shows how they affect the whole family. I really loved this book too. My only frustration was with the ending. I felt like she was building up to revealing the decision only to leave the reader hanging. But, she has done that before so I should have been prepared. I could see this being a movie too! I really loved this book and your excellent review was spot-on, as usual. This book has been on my list to read for a while. Glad to know you liked it so much! This is on my list too, but thought it would be too emotional for me earlier in the summer. I'll give it a shot this fall. This sounds really good. I will put it on my TBR list. This sounds great. Have you read her book Love Anthony? It's about autism. I loved it. I listened to the audio book which is narrated by Debra Messing (Grace and Will and Grace). She's fantastic. Anyway, I'll have to read this one!